You may remember a few weeks ago I posted about our new hardwood floors. 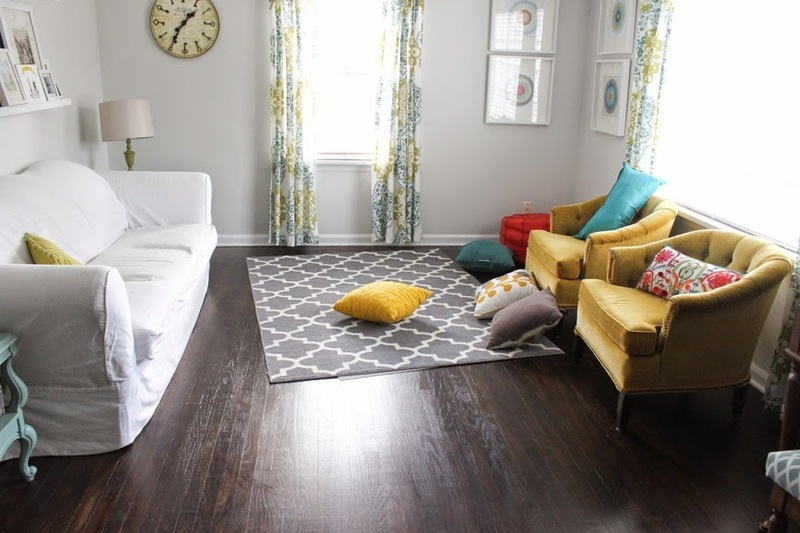 I love the floors and even bought some new area rugs to protect the high traffic areas. Well, the Rug Pad Corner contacted me and offered to send some rug pads to pair with my new rugs. I was so excited because I actually had bought cheap rug pads but the rugs slipped all over the floor. Literally, every day my kids would run on the living room area rug and it would slide. This is what my living room looked like after the kids played in the room. I had to straighten the rug at least once a day-those of you with kids know what I'm talking about. It was pretty annoying. I checked out Rug Pad Corner and picked a non slip felt and rubber rug pad especially for hardwood floors. It is awesome not having to straighten my rug. I have had the rug pad under the area rug for over a week and haven't have to straighten it once. And for someone like me who is self described as borderline OCD and actually cares that the rug is straight all the time-this is huge! All of you can use the coupon code REVIEW15 for a 15% discount off your entire order at Rug Pad Corner! *I was provided product for this review but all statements are my own. Thanks so much for supporting my sponsors!